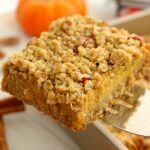 Pumpkin Pie Bars – for more than just Thanksgiving! 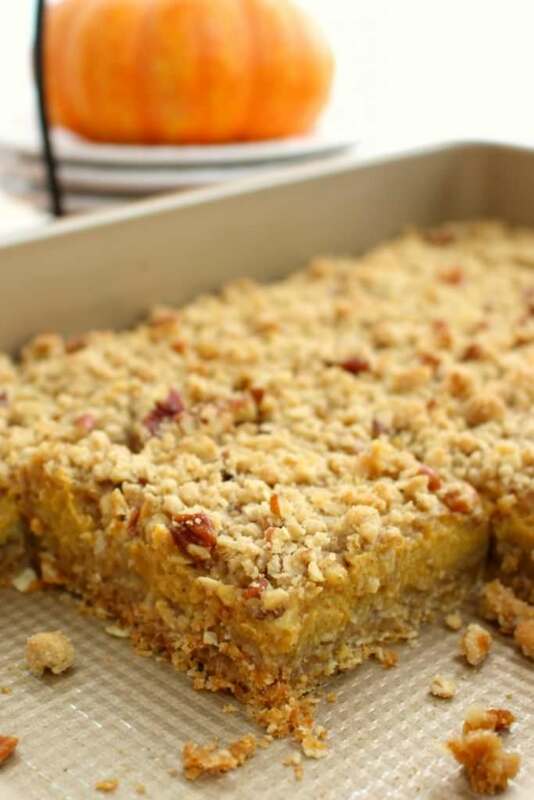 Even easier than pie, these Pumpkin Pie Bars with Pecan Crumble are the perfect fall dessert! 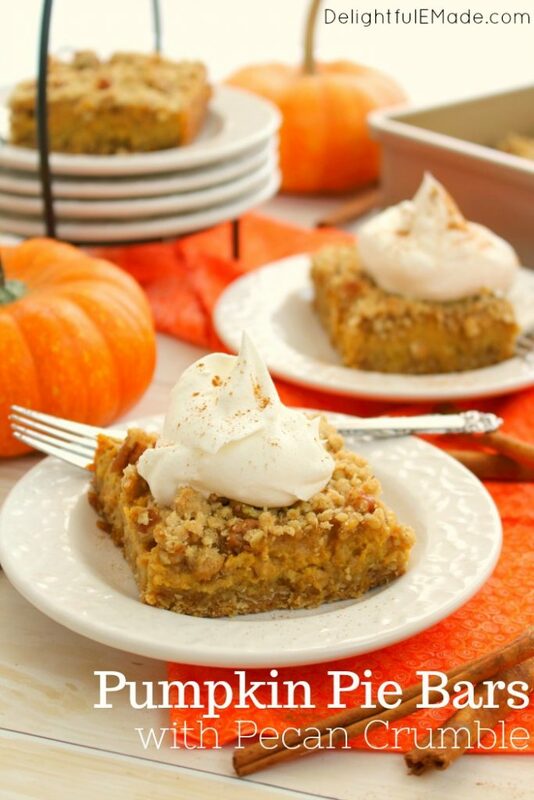 Made with a simple oatmeal brown sugar crust, and topped with an amazing pecan crumble, this pumpkin dessert will be even more popular than the classic pie! 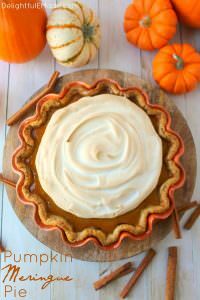 I’m always on the lookout for awesome fall desserts. I love those fresh-baked flavors of fall, and the wonderful aroma of cinnamon and spices that come with these amazing treats. 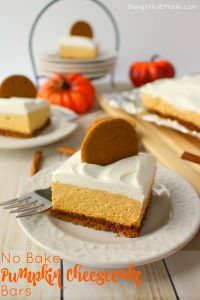 Pumpkin desserts are my definitely my love language and are perfect for serving from September all the way through Christmas! 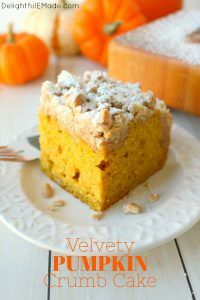 With this in mind, I knew Pumpkin Pie Bars were next on my fall baking list! 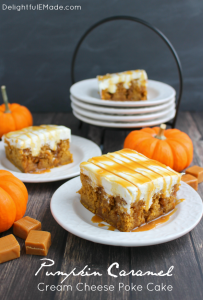 These yummy Pumpkin Pie Bars were inspired by a few things. 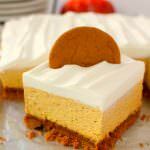 I knew I wanted to mimic the flavors of the classic pumpkin pie, but I also wanted the ease of a bar, particularly one with a simple crust. I decided to adapt my Blueberry Oatmeal Breakfast Bar recipe, by adding a creamy, delicious pumpkin pie filling and adding crunchy pecans to the top. 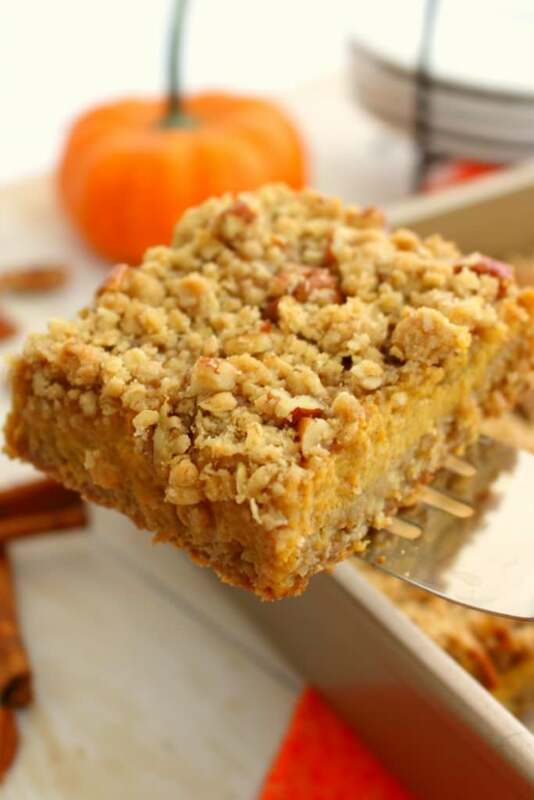 The results were spectacular, and yielded this amazing Pumpkin Pie Bars! This crust recipe is really simple to make and comes together in moments. Simply mix together the oatmeal, flour, brown sugar, baking soda and salt together in a mixing bowl. Then, add the melted butter to the mixture stirring together until crumbly and completely incorporated. Firmly press 3/4 of the crust mixture into the bottom of a 9×13″ pan, making sure to reserve the remaining 1/4 for the topping. 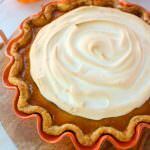 Mix the pumpkin pie filling together by whisking the granulated sugar, pumpkin, evaporated milk, eggs, pumpkin pie spice and vanilla together until smooth. Pour the filling over the prepared crust. (No need to pre-bake the bottom crust. This will bake with the filling.) Bake the crust and filling at 350 degrees for 20 minutes. To the remaining 1/4 of reserved crust, you’ll then add the chopped pecans. 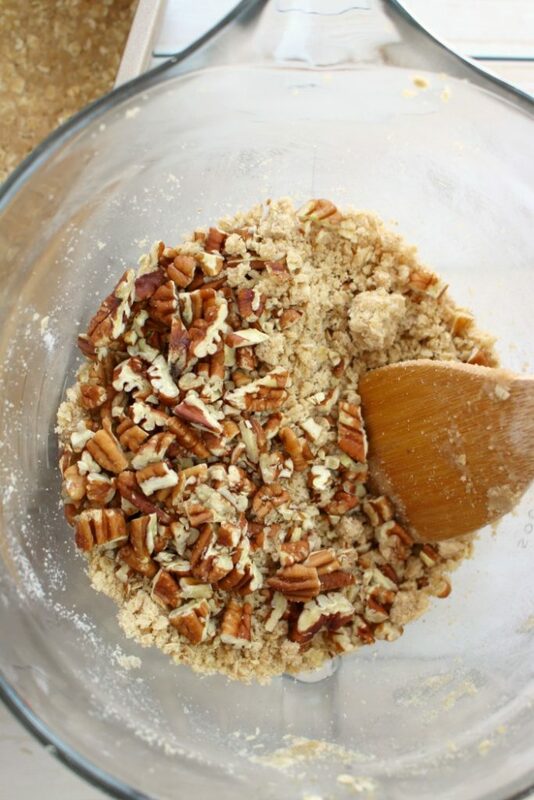 Set this pecan mixture aside, as it will be added once the pumpkin bars bake for 20 minutes. Adding the topping later helps ensure the pecans don’t over-brown and so the topping doesn’t sink into the pumpkin filling. 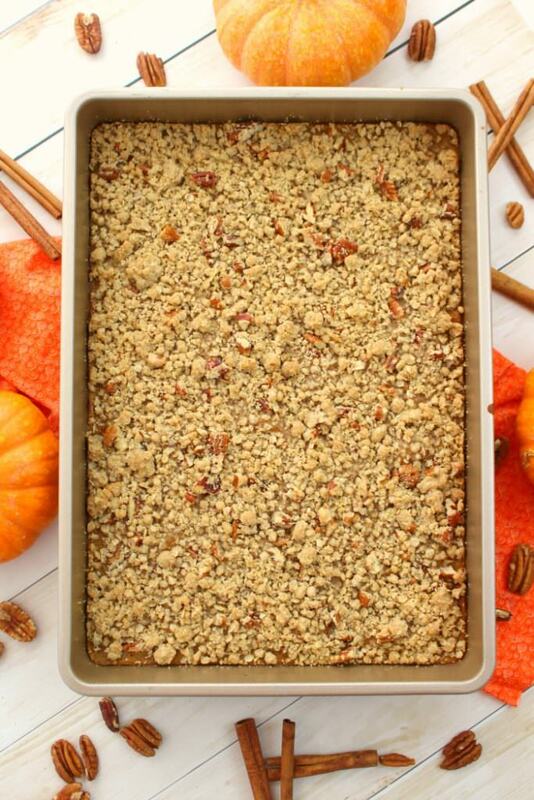 Once the bars have baked for 20 minutes, evenly add the pecan/crust topping over the top of the pumpkin filling. Continue to bake the bars for another 15 minutes, until the top crust is lightly browned and the pumpkin filling is set. Your house will fill with the amazing aromas of fall, cinnamon and pumpkin! Once these bars come out of the oven, let them come to room temperature before cutting into squares. 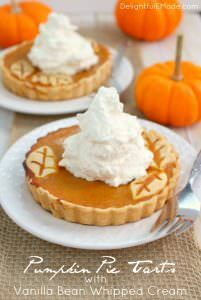 This is also a great Thanksgiving dessert to make the day before and then refrigerate overnight. 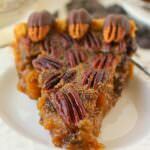 The creamy, delicious pumpkin pie filling is the perfect match with the oatmeal brown sugar crust and crunchy pecans! 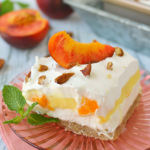 Serve with a dollop of whipped cream or even a scoop of vanilla ice cream. These bars would also be fantastic served with one of my White Chocolate Pumpkin Spice Lattes! For the crust: In a mixing bowl, combine the oatmeal, flour, brown sugar, baking soda, cinnamon and salt. Melt the butter, and pour over mixture. Stir together until completely incorporated and crumbly. To a 9x13" pan, add 3/4 of the crust mixture, and press firmly to the bottom of the pan. (The bottom of a measuring cup works well.) Make sure to reserve the remaining 1/4 of the crust, as you'll use this for the topping. For the pumpkin filling: In a mixing bowl, add the pumpkin, milk, sugar, eggs, pumpkin pie spice and vanilla. Whisk together until smooth and all ingredients are incorporated. Pour over the top of the pressed crust. Bake at 350 for 20 minutes. While the crust and pumpkin filling bake, chop the pecans and add to the remaining 1/4 of the crust mixture. Once the bars have baked for 20 minutes, remove from oven. Top the pumpkin evenly with the pecan/crust crumble. Bake the bars for another 15 minutes. 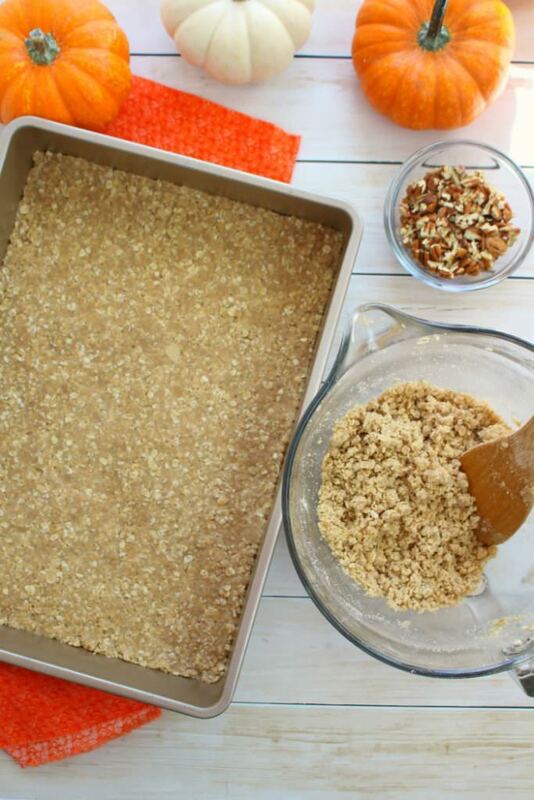 Remove from oven and let bars come to room temperature before slicing. Refrigerate any leftovers in an airtight container. Bars are best served chilled. They are easier to cut when cold, and will yield a more uniform square. Great served with whipped cream. This looks so tasty! 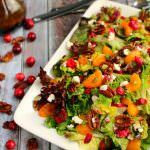 Will be including your recipe in my MM roundup this week. 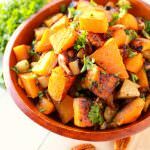 What a yummy alternative to pie! Thanks for sharing at the What's for Dinner party!